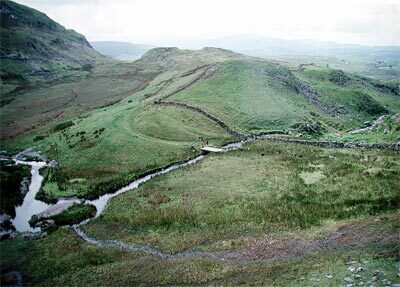 The Flavian auxiliary forts in Gwynedd are linked by a network of military roads. The mountainous terrain of North Wales resulted in a layout and morphology of Roads that is still poorly understood. It is interesting to note that the Ordnance Survey Historical Map and Guide to Roman Britain only classifies the route of 40km of road in Gwynedd as ‘definite’ and 70km as ‘possible’. The total length of road must have exceeded 280km. Varying amounts of data exist for the missing 170km. The approximate lines of some routes are dictated by geography but their exact lines are in dispute, others such as a likely road across Anglesey are unknown. Much of the country [of Wales], even when not actually mountainous, is very hilly and broken, rendering aligned roads out of the question and causing frequent construction of terraced roads which are usually much narrower than normal. Thus the roads, where visible in their original form, are often only some 9 feet wide, and a large agger, wide ditches, or a well-marked alignment are rarely seen, all factors which render the observation and recognition of roads as Roman work unusually difficult. Margary’s synthesis of the roads in the region must still be seen as the starting point for any study in this field. Some additions and refinements have been made to his study but, as noted above, substantial stretches of the road network still remain conjectural. Research continues in this field at both a professional and amateur level. It was realised that little of the disparate information concerning Roman roads was easily available via the regional Sites and Monuments Record. Until the recent introduction of Geographical Information Systems (GIS) software, it was not possible to record complex linear features such as roads in the relevant databases. 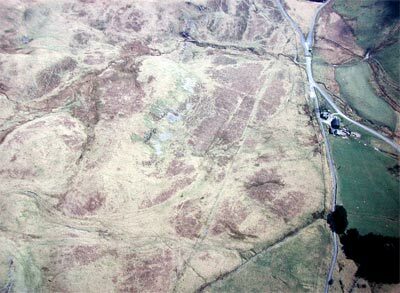 A project seeking to examine the Roman roads of Gwynedd was initiated in 2002/03 and followed on from a study of Roman fort environs. The first year of the project consisted mainly of scoping and examination of the extent of the available data (GAT report 497 Roman Fort Environs 2002/2003 Appendix 1). The second year, 2003/04, adopted an approach set out by CPAT in Roman Roads in Mid and North-East Wales (report 527, 2003). The 2003/04 phase of the project involved a desktop assessment of existing records and other sources, GIS mapping of the known and suspected roads in the region and the production of a report. The report illustrates the current state of knowledge, provides a hard copy of the GIS data and highlights where further work in both documentary assessment and fieldwork is required. The GIS/database information has been compiled in a format that can be accessed alongside core Sites and Monument Record data in MapInfo thus allowing access to detailed information about the form, condition, survival, status (level of confidence in the route), and physical details of each stretch of road or proposed road. All of the major known and projected routes have now been assessed and mapped and the data is now accessible via the regional Sites and Monuments Record. This is the first time that detailed information about the Roman roads of Gwynedd has been available in an accessible format and this now ensures that meaningful planning and management advice can be provided for this class of monument. The data is also available for researchers working on the ever-popular subject of Roman roads. Much research has already been carried out at both a professional and amateur level and this has produced a large corpus of data some of which is contradictory and some of which duplicates earlier work. This has now been analysed and the 2003/4 report illustrates the current state of knowledge and highlights where further work can most profitably be carried out. Some preliminary targeted fieldwork was carried out in tandem with the desktop analysis. This initially examined a selection of better preserved roads, as ‘case studies’, by fieldwalking and basic GPS plotting in order to confirm their detailed routes, make management recommendations and formulate strategies for further assessment.